Found 7 file extension associations related to Star Trek: Elite Force 2 and 4 file formats developed specifically for use with Star Trek: Elite Force 2. 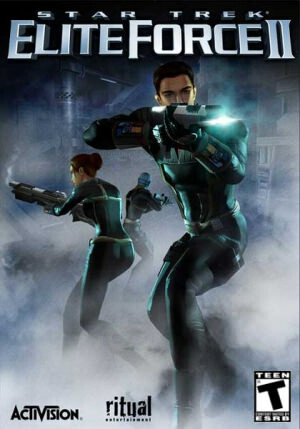 Star Trek: Elite Force 2 is a first-person shooter computer game developed by Ritual Entertainment and released by Activision in 2003. It a sequel to Elite force, a rather successful game from Star Trek universe. When the U.S.S. Voyager returned to Federation Space safely, the Hazard Team was disbanded. However, Lt. Alexander Munro was assigned to Starfleet Academy and quickly caught the eye of Captain Jean Luc Picard. Players must take charge of the reunited Hazard Team on the U.S.S. Enterprise and confront an assortment of cunning enemies. Enemy races include Klingons, Romulans, Ferengi, and the Borg. Missions take the Hazard Team to frozen Romulan bases, Star Docks, Borg Ships, and Starfleet Academy. Available weapons include: tricorders, disrupters, I-Mods, energy staffs, assault rifles, grenade launchers, compression rifles, quantum bursts, and the Bat'Leth (a Klingon melee weapon). Multiplayer game modes feature capture the flag, holomatch, and team holo match in environments ranging from murky jungles to volcanic deserts. Star Trek: Elite Force II runs a modified Quake III: Arena engine with increased environmental and character detail. If you need more information please contact the developers of Star Trek: Elite Force 2 (Activision), or check out their product website.